A guest post from my colleague, Heeru Bhojwani, the Elementary Librarian at the American School of Bombay in India, who is sharing with you the reasons why we decentralized our traditional library to create ASB's Information Commons (iCommons). 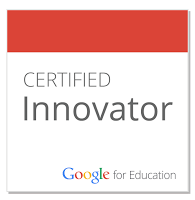 Heeru originally delivered this presentation at ISTE in June. International School of Brussels showed higher test scores at the graduation level. Meadow Dale School, Washington, showed scores that were above state standards on MSP and EOC exams. Last year, ASB’s Administrators along with the board members took the courageous step to re-design the school, this lead to a creation of a new campus for the ES and a new learning space for MS and HS students. This triggered the creation of our iCommons. Inspired by the world architects of new school design, Fielding Nair International, ASB took the step of designing open classrooms. Walls were taken down and replaced by screens and sliding shades to create open collaborative spaces for learning. Groups of– teachers, students, parents and administrators brainstormed to come up with functionalities and designs that were important for a learning environment. Finally, new learning spaces were designed. Then came up the question of our library – we all know that a library is a center of an education institution, without which schools cannot function. The library is a powerhouse of learning. At that point, the Elementary Principal and I met to talk about our vision, design and location for the school library. At the same time a group of teachers brainstormed and discussed about the library. There were 2 reading specialists, 2 librarians, the Assistant Principal, the Elementary Principal and the PYP Coordinator. Of course, there were diverse views and opinions regarding the decentralization of a library, it was like breaking the sanctity of a temple for the whole community. It was a very difficult decision. The most favored opinion was to create 2 libraries one for Kindergarten to Grade 2 and the other for the Upper Elementary. We also designed new book carts to facilitate easy browsing as compared to looking at spines on the shelves. We designed our own book carts that worked well with our campus. We discussed the functions and features of a library and we realized that a library had 3 important functions. 3. a quiet spot to read and learn. Now, if we believe that a library is a center of an educational institution, then it would be clear to say that a library is also a center of a child’s learning journey. In an ideal situation, we would like every child to have his own library at his fingertips. A librarians’ dream is to see the right book in the hand of a child at the right time. And, if we are to believe all this to be true then I think creation of these 6 libraries or iCommons truly resonate with a 21st century learning environment supporting students in mastering information literacy skills. Another important reason for spitting the traditional library were the different types of classroom collections. Why do classrooms have their own library? 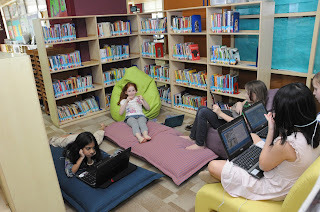 Why were they developed every school has its own centralized library, why do some classes have a leveled library, and others have other specialized library for their projects or curriculum based connected materials? These resources began to find a place in the classrooms or close to their classrooms? WHY? Why have several libraries. This also made me realize that if we move our centralized library collection closer to the children, it would truly become the hub for their collaborative learning. Imagine every grade level has the comfort of a library along with its diverse resources! We define the iCommons as an information Commons, a place where students interact, share ideas and information and respond positively to become information creators. They use digital tools to demonstrate their understanding and thinking. The iCommons is situated at every grade level right outside their learning spaces. It is an extension of their classrooms. Members of the community and students are responsible for the resources, students check out their books and other resources independently, there are teachers and teaching assistants to support their selection. All materials are found in the iCommons – ranging from picture, nonfiction, magazines, videos and playaways. Questions often asked were there enough books for all – yes there were15,000 books and playaways, magazines etc. Were there any duplications Yes, there were duplication when class sets were added. This was a good thing since it provided extra copies for the popular titles and no extra budget was necessary to buy those books. Adding the centralized library collection developed a full-fledged collection for the iCommons. In each iCommons the reading level of the resources was 2 levels above and 2 levels below the grade level. In the 1st step , data was transferred electronically within Follett into an additional site. Each book on the shelf was analyzed by the librarian, and on the basis of Interest level, age appropriateness, curriculum connections, then it was allocated to a grade level. So, I had 6 baskets in front of me and after looking at the appropriateness the book it was placed in an appropriate grade. It was quite challenging for some of the titles – I had a tough time deciding the grade levels for the popular titles that were used by different grades along with the series. I think because of my experience at the school, and understanding the curriculum and population of students it made is easier for me to decide. But this problem was rectified when I later saw the class collection. For example the Anthony Horowitz series are popular with grade 4’s and 5’s so I split the library collection and decided to house it in both the grade levels but later when the class collections were added into their grade level iCommons I found that many of the classrooms had multiple copies of the same titles that library did not have. The circulation type was divided into 6 grade levels – Generally the circulation type indicates the type of book – whether it is a fiction, a picture book, biography or one of the DDC numbers. But instead we allocated grade levels to the iCommons instead. The IRA recommends a strong research based collection because it fosters and demonstrates positive attitude among students and develops a strong and complex language structure. They request librarians to collaborate with reading speciaslits to participate and develop and all round collection for the students. Susan Newmann in her article Classroom Collection writes that a rich collection near the heart of their learning environment incresase literacy related engagements and activities. Fountas and Pinnell recommnends – 300-600 books in a rich collection. A varied collection with all different genres leads to the development of rich language skills that foster oral and written communication skills (needed for the 21st century work force). Interest, age and curriculum connections helped me decide the location for the book. Genres – Grades 3 – 5 wanted to have a book store effect so that books were books are arranged according to genres. The classroom teachers picked 3 main genres – mysteries, fantasy and historical fiction for their iCommons. Color codes and stamps were added to indicate the floor of the iCommons. And finally the collection was added into the respective iCommons. The process started in April and we moved in by mid-August 2012. I know many of you must be thinking about the 70’s when the open classroom concept didn’t work. Back then there was no internet. We must keep in mind that digital information and media have penetrated our lives and there is no stopping or looking back. It is essential that we capitalize on this phenomenon to prepare our students for the future world. Research and evidences are indicating that libraries are rapidly expanding their web-based information, More and more print books and journals are being replaced by ebooks. Library collections are moving to cyberspace. The turning point came in April 2011, when Amazon reported selling more eBooks than print books. The ALA report asks librarians to focus on digital literacy and the key features are information literacy, media literacy and research. They recommend creating a “tech playground “in the library to promote services related to ebooks and online services. If these are important issues then it is evident that now it is the time to invest and proactively support our students to navigate the large databases of information. Our role has changed to some degree and yet stayed the same. Earlier librarians helped students in the literacy programs which is now replaced by digital literacy, earlier we supported students in research using books and now it’s replaced by ebooks and the vast information in the cyber world. Mini Workshops were held for Teachers and TA’s to understand the concept and purpose of the iCommons. They were shown how to access the physical books and ebooks in our new physical and digital spaces. Students, too were taught how to access their books. Some TA’s were further trained in to shelf, locate and help with the inventory. This created a feeling of ownership among the community. Change in the Parent mindset was important and also led to several workshops on understanding the use of iCommons as well as accessing the online databases and ebooks. Parents were educated or brought up to speed in understanding the importance of information literacy. This academic year, books were replaced by ebooks and other titles that met the needs of the curriculum. Most of the books were ordered through the library and so if a title that was required by the teacher was available in an e format, it was recommended. Yes, the process was not as rapid as we would have liked it to be but it is surely changing. Books used for literature circles with multiple copies they too were added into the iCommons. We fulfill the role of an information coach to promote information fluency. Research focus is now on creation of knowledge and not mere passive consumers of information or regurgitating facts in a different format. Independent studies and media classes were introduced. These classes were co-taught with the Tech Coordinator. Students were guided into selecting their own topic of their interest, they wrote down their questions, students learned to transform their closed ended to create open ended questions, students learned to select appropriate websites, evaluate, analyze, synthesize and finally demonstrate their understanding using a digital tool. The research cycle was followed. Students learned the importance of selecting copyright free images, to cite resources, understand plagiarism and the importance of creative commons and copyright concepts. In the media classes, students learned photography, digital art and movie making. They created movies for entertainment, public service announcements or simply describing a topic. Continuing to mentor students in their global learning engagements and personalized learning automatically are a part of the librarian’s job. Tony Wagner, in his article Rigor Redefined (ASCD) says that for students to be successful it is necessary for them to be able to interpret, evaluate and analyze data and think creatively to problem solve. He goes to say that even the “best” schools are failing to prepare students for 21st-century careers and citizenship. Tony interviewed a number of company heads and asked what they were looking for in their candidates and they said that they could teach them the technical stuff, but they can't teach them how to ask good questions—how to think. Today's students need to master seven survival skills to be survive in the new world of work. And these skills are the same for them to become productive citizens of the world. It is these skills that will help solve some of the pressing issues we face in the 21st century. Information fluency, Media Literacy, MOOCs and Creative Products are important ingredients of today’s education. Our role is to continue to support, mentor and guide users to become champions in information and media literacy. When students begin to think creatively they then use information to solve and evolve in their understanding, automatically leading students to create rather than be passive consumers of information. According to a paper The Hyperlinked Library by Dr. Michael Stephens, the librarian must connect with the heart. It satisfies the needs and wants of users - something librarians have always done well. AT ASB, we have tried to create this dream where the iCommons is the center of child’s learning journey where students collaborate, engage and create – where technology and physical books are merging together to create the magic of learning.